The phrase “grass roots tinder” is literal and not figurative. This was my latest pursuit. I was pulling up new clumps of grass that sprouted up in the mulch covered landscaping. 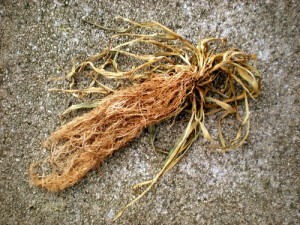 I would shake loose the soil and lay them root-side up to neutralize them until they could be collected for disposal. A few days later, when I collected my uprooted tufts of grass, I marveled at the extensive root system that was both fine and dense in texture. I decided to set some aside to dry out further for testing as a potential source for tinder. Why use grass roots for tinder? Each environment that you encounter may or may not have the tinder resources that you need. Survivalists would suggest that as you travel about, collect potential tinder as you go so that you will be prepared when you need to create a fire. 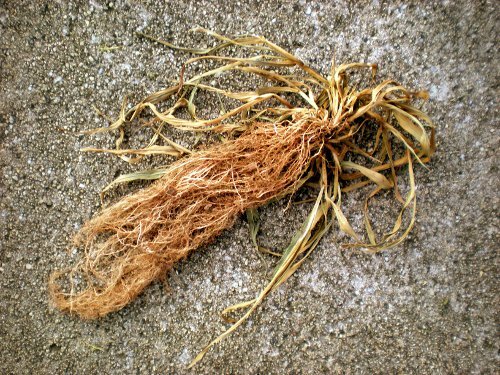 Because roots initially contain moisture, they will need to be dried out for several days, so they would be a more long-term prepped tinder. I decided to take two fire starting approaches: sparks by ferro rod and solar by wallet-sized Fresnel lens magnifier. When I first applied sparks with the ferro rod it didn’t work. I realized that I needed to fluff out the roots into a wispy ball, much like I would treat cotton or steel wool tinders in order to catch a spark effectively. The next spark caught immediately. When I used the pocket magnifier I initially got lots of smoke but not a sustainable ember. Although I had compressed the roots for this approach it needed more compression so I twisted the small bundle as if to make cordage into a small ball. That did the trick. I suggest having as much mass as possible with more tinder standing by to supplement the ember once it’s established. Generally speaking there is a multitude of tinders more readily available but it’s always good to be aware of alternative tinders when circumstances limit your regular choices. This entry was tagged Ferro, Ferrocerium, Fire, Flame, Freznel, Grass, Lens, Roots, Solar, Tinder. Bookmark the permalink.